With its compact and unique design the PC I ZOOM Series are the best companion for travels. Multi-coated lenses ensure clear view of city scapes. The PC I allow you to spot the stunning facettes of urban sceneries. Prism type: Roof-prism.  Magnification: 12x.  Objective Lens Diameter: 25 mm.  Exit Pupil Diameter: 2.1 mm  Angle Of View: 4.5°.  Eye Relief: 16 mm.  Closest Focal Point: 3.5 m.  Size: 114 x 98 x 48 mm. 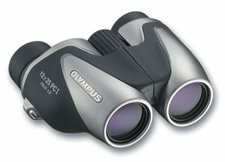  Weight: 280 g.
All OLYMPUS binoculars come complete with case, neckstrap and protective lens covers. Prism type: Roof-prism.  Magnification: 10x.  Objective Lens Diameter: 25 mm.  Exit Pupil Diameter: 2.5 mm  Angle Of View: 5.2°.  Eye Relief: 15 mm.  Closest Focal Point: 2.5 m.  Size: 114 x 98 x 48 mm.  Weight: 280 g.
Prism type: Roof-prism.  Magnification: 8x. 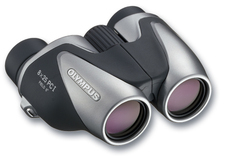  Objective Lens Diameter: 25 mm.  Exit Pupil Diameter: 3.1 mm  Angle Of View: 6°.  Eye Relief: 16.5 mm.  Closest Focal Point: 2.5 m.  Size: 114 x 98 x 48 mm.  Weight: 280 g.